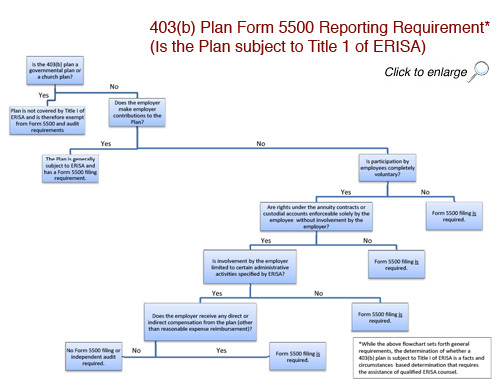 From the enactment of ERISA in 1974 until 2009, 403(b) plans did not have to comply with the annual 5500 reporting requirements that applied to most other retirement plans. This is because the U.S. Department of Labor issued a limited reporting exemption in 1975 requiring only a 2- page filing listing plan and sponsor name and address, and not much more, for 403(b) plans subject to ERISA. After the Internal Revenue Service issued new regulations under section 403(b) in 2007 (the first guidance from the IRS in this area in over 40 years), the DOL revoked this limited reporting exemption in a notice dated November 16, 2007 for ERISA covered 403(b) plans. Elimination of exemption from annual Form 5500 reporting requirements. Written plan document requirement for all 403(b) plans. Narrowing of the allowable exclusions from the universal availability requirement. Availability of after-tax Roth contributions. A 403(b) plan is not covered by Title I of ERISA if it is a governmental plan or a church plan, or qualifies as a "safe harbor" plan. The determination of whether a plan is subject to ERISA is fact intensive and is best made in consultation with an ERISA attorney. The level of employer involvement required to fail the safe harbor test is quite low, and the consequences of an incorrect determination can be devastating (in terms of dollars), so do talk to your attorney and be sure you have it right. Reference this decision tree for help in determining if your 403(b) plan has a Form 5500 filing requirement. If your plan has a Form 5500 filing requirement please see plan audit decision tree on 401(k) FAQ Page to determine if an audit is required for your plan. The DOL has issued guidance on pre-2009 contracts in two Field Assistance Bulletins, in July 2009 followed by a Q&A in February 2010. The rules are somewhat complex and we are happy to revisit this issue in detail with plan sponsors, as the application depends very much on facts and circumstances. There may be instances where it is appropriate and the plan sponsor chooses to exclude certain pre-2009 contracts from the audit and plan's financial statements. If assets are excludable, then the participant may also be excludable from the census count, if they are not otherwise an active participant in the plan. The rules of the FABs continue to apply in years subsequent to 2009. The contract or account was issued to a current or former employee before January 1, 2009. The employer ceased to have any obligation to make contributions (including employee salary reduction contributions), and has ceased making contributions to the contract or account prior to January 1, 2009. All of the rights and benefits under the contract or account are legally enforceable against the insurer or custodian by the individual owner of the contract or account without any involvement by the employer. The plan sponsor has an obligation to take reasonable steps to resolve any questions regarding exclusions of such annuity contracts or custodial accounts. In making the decision to include or exclude assets under the FAB, the plan sponsor should be sure to discuss with the auditors the impact on how their opinion will read. Exclusion will result in a disclaimer opinion that may carry forward for many years, however this will not result in rejection by the DOL. With a number of years of 403(b) audits behind us, these audits are getting easier. They more closely resemble 401(k) audits with the challenges of opening balances for the most part behind us. However, plan sponsors may still have disclaimer or qualified audit opinions they would like to get rid of. We are happy to discuss these complicated issues. As with any plan audit, plan sponsors preparing for their 403(b) audit are well-advised to talk early and often to their auditors about the information they will be looking for. It is helpful to have a time-line or history of their plan, noting original effective date, vendors used, entities participating and other relevant information. They should become familiar with their plan document, to the extent that they are not already. Sponsors who are well-prepared and communicate well with the auditors will likely find the audit process goes smoothly. Since the issuance of the new regulations, Caron & Bletzer has closely watched developments in the 403(b) area. We are entering our eighth 403(b) audit season. We continue to stay abreast of 403(b) changes and Department of Labor (DOL) and IRS guidance. We are fully prepared to work with you and share our knowledge to ensure your 403(b) audit is as smooth and efficient as possible.